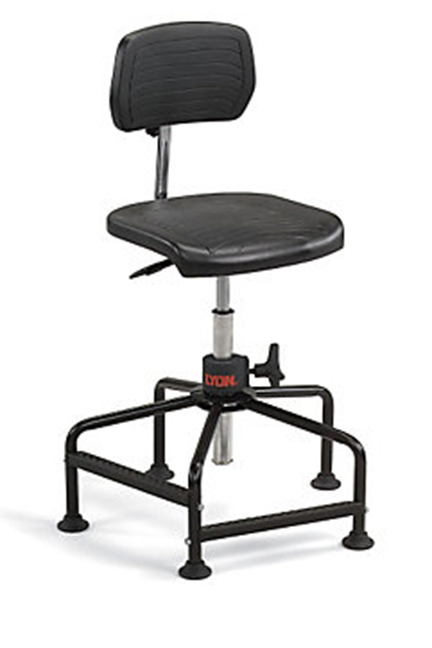 Quality LYON Polyurethane Task Stool stool stands up to heavy-duty use. Includes two polyurethane-over-steel footrests for comfort and support. Soft form-moulded polyurethane upholstery. Pneumatic adjustment. Adjustability includes: back height, seat height, and footring height. Optional arms available. Recommended for 24-hr. continuous use. Self-skinned polyurethane. Lifetime guarantee on pneumatic cylinder. Sturdy 27" dia. reinforced plastic base. Pneumatic seat height adjustment. Soft-form moulded polyurethane upholstery. Five-leg tubular black base includes a supportive footring. Adjustability includes seat height. Polyurethane upholstery. Adjustability includes: seat height and manual back height. Optional arms available.